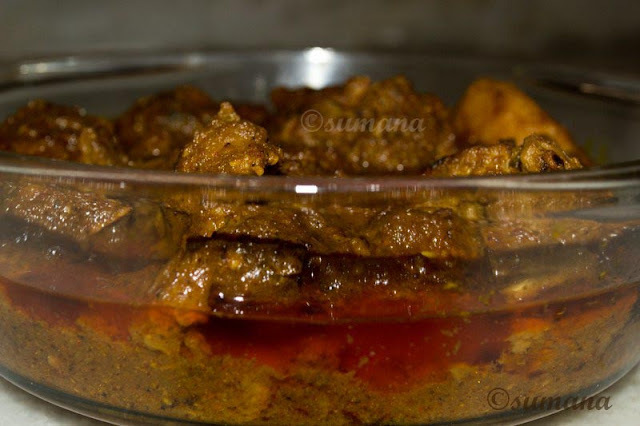 Mutton Kasha (aka Kosha Mangso) is a traditional Bengali dish. This mouthwatering mutton curry is a bit spicy. Authentic mutton kosha does not require water and is cooked in low flame for a long time to make the meat very soft. As people do not have much time these days, pressure cooker is used to quicken the process. Also a little bit of water can be added if you want more gravy. Marinate the mutton with curd for 3-4 hrs. Take oil in a pan and add bay leaves, little bit sugar and a pinch of turmeric powder. Now add sliced onion and onion paste and fry till golden. Then add ginger-garlic paste and fry it. After 2 minutes add marinated mutton and mix it. Now add salt and all spices. Stir well till the oil is separated from mutton. Now shift it into a pressure cooker and cover the lid. Wait for 10-15 minutes or until the mutton softens. Serve hot with rice, pulao, roti, paratha, puri or anything you wish.